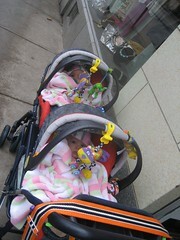 Last week Tari and I met at Arthur’s, with our girls. We had planned to walk around Hyde Park after our lunch, and we did, for awhile, despite the rain. 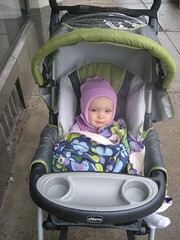 But eventually it began to rain too hard and we worried about the girls getting too cold—no matter how cozy they looked in their strollers. This entry was written by kara, posted on February 16, 2009 at 11:30 pm, filed under Uncategorized. Bookmark the permalink. Follow any comments here with the RSS feed for this post. Post a comment or leave a trackback: Trackback URL.